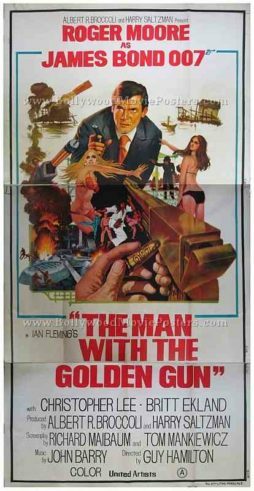 Highly collectible James Bond original movie poster of the Roger Moore classic, The Man with the Golden Gun (1974) for sale. Featured here for sale is an actual surviving original James Bond movie poster of the ninth film in the cult spy series, The Man with the Golden Gun. Printed during the local release of the film in India somewhere in the late 1970s, this old Roger Moore Bond poster was originally intended for publicity of the film but never ended up being used. In a 2004 Academy Awards poll, Roger Moore was voted as the “Best Bond” ever, making this classic James Bond poster highly collectible! In this original Roger Moore 007 poster, the iconic golden gun and bullet are seen hand painted prominently on the center sheet. A small painting depicting a kung-fu scene from the film appears in the center. As is the norm with all James Bond movie posters, two Bond girls are seen in bikinis on either side of Roger Moore. This three sheet original James Bond movie poster measures a stunning 80″x40″ inches when its three individual sheets are joined together. This rare original beauty was intended to be displayed inside a cinema foyer in India that actually screened this cult James Bond movie in the 1970s! The three individual sheets are numbered as Bit I, Bit II & Bit III printed on the borders. In the primary photograph shown alongside, there might be a slight gap visible between the three sheets as each sheet has been photographed individually and a composite image has been created by joining them together digitally. When put together, the three sheets will line up perfectly and there will be no gap between the same – i.e. the result will appear as one seamless poster. The Man with the Golden Gun (1974) is the ninth spy film in the James Bond series and the second to star Roger Moore as the fictional MI6 agent James Bond. Inspired in parts from Ian Fleming’s novel of same name, The Man with the Golden Gun capitalized on the martial arts film craze at the time of its release, with several kung-fu scenes and shoots at key Asian locations such as Thailand and Hong Kong.